I was watching the Police Half Marathon this morning, waiting for my buddy Neil to run past. This was at the aid station in South Glenmore Park, near the boat docks. I had never really paid any attention to an aid station before, and today I was thinking about it from a process point of view. Please note, this is not intended to criticize these volunteers. Races can't happen without them, and they're doing their best. Racers are part of the problem as well. Let me set the scene. The race route is along the south part of the Glenmore Reservoir, heading west. They run through the parking lot where the aid station is set up. Here's a little map. The red arrow is runners, the black square is where the tables were set up, and the black x's are where the volunteers were standing. There was probably more than 5. Nobody injures themselves or others in the process. Runners are not slowed down any more than necessary. Runners that simply stopped in the middle of the pack in the aid station. Runners that abruptly changed direction to head for a different supplier, sometimes several times. Volunteers crossing the run path to supply drinks from both sides. Runners taking nutrition while walking or running through the aid station. One runner was trying to pour water from a cup into a flask, while walking, while in the aid station. It was difficult for runners to determine who had water or gatorade. Everybody was shouting "Water, Gatorade". Everybody, all at once, all the time. Each volunteer appeared to have water AND gatorade. Everybody seemed to have only a right hand, even when that complicated things. One runner reached with his right hand across his body to the volunteer on his left. Most volunteers were holding out cups in their right hand, palm towards the runners. Most of the volunteers were holding the cups like they were holding a water glass. Most volunteers were standing too far from the tables and had to walk back and forth. Some runners dumped water on their heads. In one case, the water bounced off their hat, into the face of the person right behind them. I hope it was water and not gatorade. Some runners got their fluid of choice, then crossed the run path to get out of the way so they could drink and perhaps eat something. Runners tossed cups and stuff towards the garbage bags, even if it was on the other side of the path from them, and other people were using that space to run in. Runners are looking for family or friends and not necessarily paying attention to traffic. In other words, it was a mess. How could things be improved? First we have to recognize that runners are focused on running and are mostly unaware of their surroundings. We need to make it easy for them. Second, we need to make it easy for the volunteers as well. Lets's start with the supply of two fluids. It is not efficient to have each person supplying both fluids. They need to remember which hand has which fluid, many times. 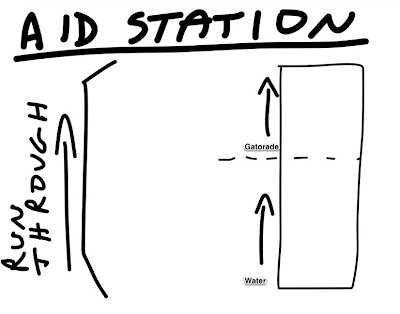 Aid stations should be set up so that fluid 1 is dispensed at the beginning and towards the middle, and fluid 2 is dispensed from the middle towards the end. Each volunteer should only take one kind of fluid, and should stand at the appropriate end. In an ideal world there would be a sign just before the aid station, perhaps something like this. I'd make the fluid words bigger of course. Maybe the words "NO STOP" should be in the middle diagram. Volunteers should be close enough to the table that they can grab more cups and hand them to the runners, without having to move their feet. Of course, more volunteers are behind the tables filling cups. In the above setup the volunteers should be handing out cups with their LEFT hands. Why? Because as they hold a cup by the bottom (fingers up) out towards the runner, it's easy to let go when the runner grabs it, and then there are no fingers or hands in the way as the runner moves the cup forward. The crew captain should explain and demonstrate this to the volunteers. It makes handing off a cup so much easier. Under no circumstances should the volunteers be crossing the stream of runners to serve drinks from both sides. Crossing the path startles the runners, and in the middle of the pack it is unsafe. Then as soon as that volunteer has dispensed their few cups, they are useless until they can cross the path and get more cups. You'll note each table mostly serves one fluid only, with a small section on the end for those that want one of each, or happen to be trapped on the wrong side of the course. 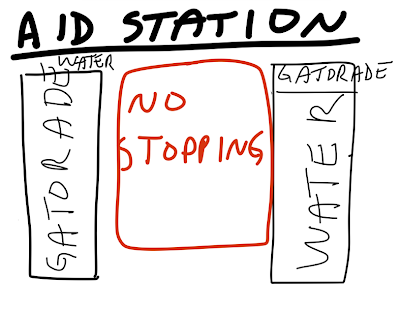 From a fluid process perspective, aid stations add turbulence to a smooth flow. In an ideal world there should be an open path for those that don't want fluids so they can run through, preferably on the left. The problem is that runners have no idea what the person in front of them is going to do. The only thing I can suggest is what my driving instructor told me many years ago, "check your mirrors and signal your intentions". If you aren't in the race top 10, you shouldn't be trying to make time in an aid station. Slow down to an easy pace. Make eye contact and point to the volunteer who has the cup you want. This will help them hand off the cup to you. DO NOT STOP in the race course! Keep moving and if you have to stop, wait till you are outside the immediate aid station, and only then pull over to drink, eat, scratch, undress, puke, whatever. Unless you know the course, it's hard to see this aid station in advance. I don't know if there was a sign just before the aid station to warn runners. I know I like to get nutrition in me just before the aid station so the water can wash it down. Trying to do nutrition right in the middle of an aid station while in motion is a dumb idea. 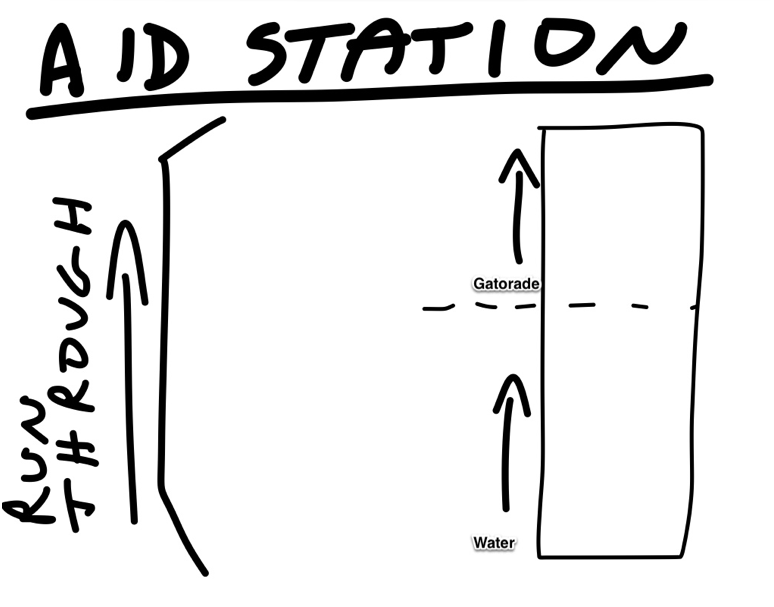 Any further suggestions on aid station design? After the short spectating stint, I'm back home for some yard work, and once it started raining, moved in to work on the GVBP. Making good progress, only a few more sections to go. Too cold to bike today. You should be working on the race organization side, when you are not running races yourself. 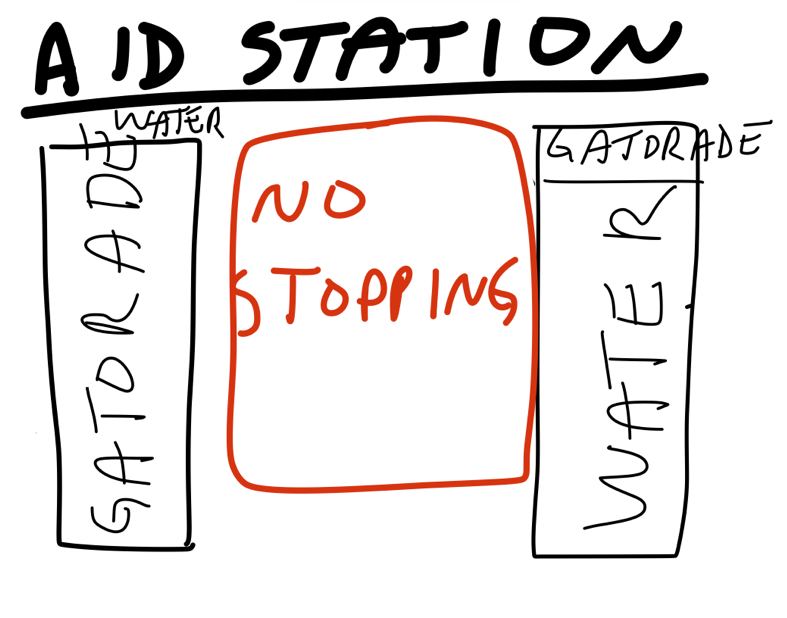 Personally, I think they should set up water only and gatorade only stations. It would be simpler. For a very VERY brief moment, I thought you were going to describe the Calgary Expo experience and some advice for them. There was some chaos, disorganization - process did not go well at all. Kris saw it all. He might have had a rant brewing, but instead he decided to watch GalaxyQuest. I think he already misses the Calgary Comic and Entertainment Expo. I agree wholeheartedly with the above comment! Keith, buddy -- why don't you get on the organizing side? You are very, very good at this kind of thing! If Kris wants to rant about the Expo, I would be please to give him a guest blog spot. My readers are always up for a good rant. I've done my time in the adult supervision box. There are stories to tell, buried bodies to point to. Neatly buried, I might add. I recognized a few "volunteer types" on display at the aid station. Brought back memories, oh yes. See my reply to Lala Mama. I've done my time in the adult supervision box. I will still be signing up to volunteer at races. I am aiming for a 1:1 balance between races and volunteering for races. I'm a bit behind on the volunteer side. If everybody aimed for this ratio, there wouldn't be races begging for volunteers. For a long time my problem was that I thought common sense was in fact common. Once I realized this was a delusion, things went much more smoothly for me.